"A delicious blend of potatoes, vegetables, and chunks of ham in a wonderful creamy soup. Everyone that has ever tasted it has said that it was the best potato soup they have ever had, honest! You can eat it straight up or top it with shredded cheese or chives. Enjoy!" Bring the potatoes, onion, celery, carrot, salt, pepper, and water to a boil in a large pot. Cook until the vegetables are tender, about 15 minutes. Add the ham, cream of celery soup, and heavy cream; return to a simmer and cook for 5 minutes. Adjust the seasoning and serve. I also want to add that in the original directions I put to add enough water to cover the veg, but they put in 4 cups. You might need a little more than that. 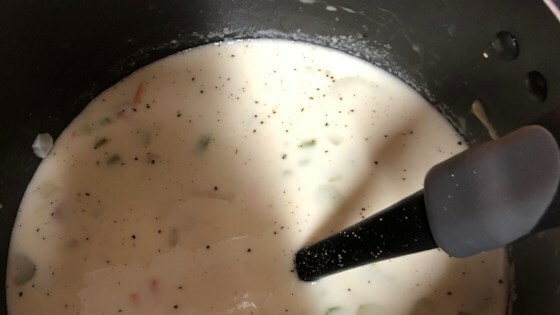 My family loved this recipe -and since my Mother-in-law's recipe is considered the be all and end all of potato soup, this was no easy feat! This recipe was so easy and delish! I only added one can of the cream of celery and it was so, so good!